Create app-icon asset catalogs in seconds. Is there a better alternative to App Icon Set Creator? Is App Icon Set Creator really the best app in Editors category? Will App Icon Set Creator work good on macOS 10.13.4? App Icon Set Creator makes it easy to generate your app icons. Simply drag and drop your large icon, select your platform and let us do the magic. We'll resize your icons and create a ready-to-use asset catalog that you can add to your Xcode project. App Icon Set Creator icons are compatible with Mac OS X and iOS, including watch OS and CarPlay. All platforms and devices (iPhone, iPad, iPod touch, Apple Watch, CarPlay & Mac) are included at no extra cost. App Icon Set Creator needs a rating. Be the first to rate this app and get the discussion started! App Icon Set Creator will create an .appiconset containing all the sizes you need for your app inside a .xcassets folder. App Icon Set Creator icons support Retina and non-Retina displays. For best results, we recommend to start with 1024x1024 PNG file. The app will upsize your icon for some formats if you supply a smaller input image. Please make sure that the icon is an exact square. 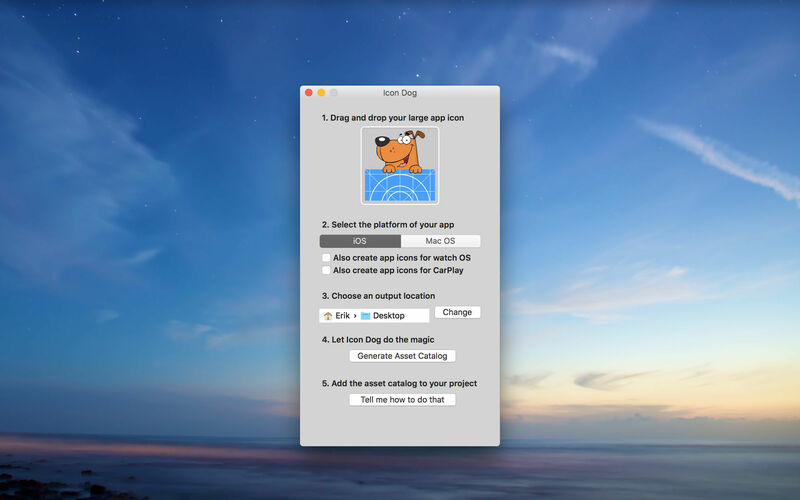 Resizing your app icons shouldn't take longer than it takes your dog to say 'Wuff' - and it surely won't if you use this app! Save time and focus on what's important: Coding amazing apps.